Kumasi, the chief town of Ashanti region, lies some 275 kilometres inland from Accra. 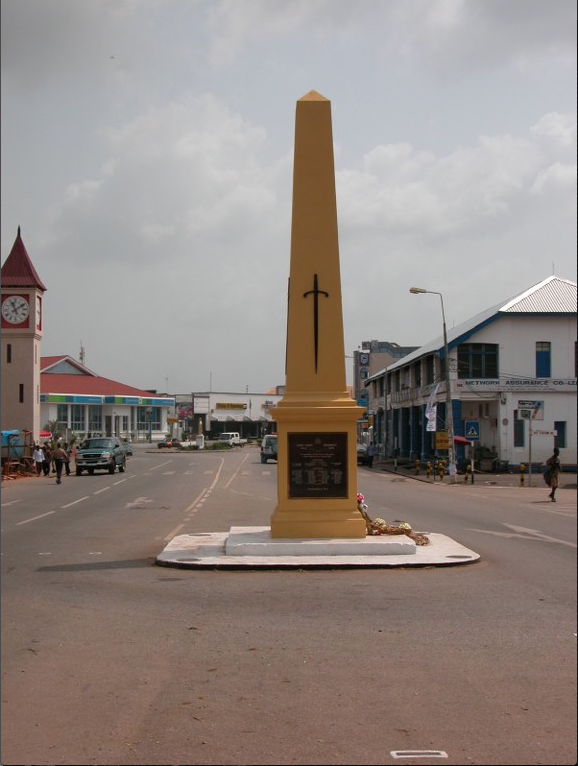 The Kumasi Memorial is located in the middle of Stewart Road, near to the Military Museum and Post Office. Ashanti War Cemetery will be found to the north of Government Road near the Military Museum. The Gold Coast Regiment, a formation of Artillery and Infantry whose Battle Honours go back to 1873, formed part of the Royal West African Frontier Force. During the First World War, the regiment served with distinction in Togoland (now Togo), in the Cameroons and in the last phase of the East African campaign. The Kumasi Memorial commemorates 768 men whose graves are unknown or cannot be marked. A/2600 Private Dezari Barama, Gold Coast Regiment, W. A. F. F., executed for murder 10th November 1918. 7560 Private Aziberi Frafra, Gold Coast Regiment, W. A. F. F., executed for casting away arms 28th September 1916.